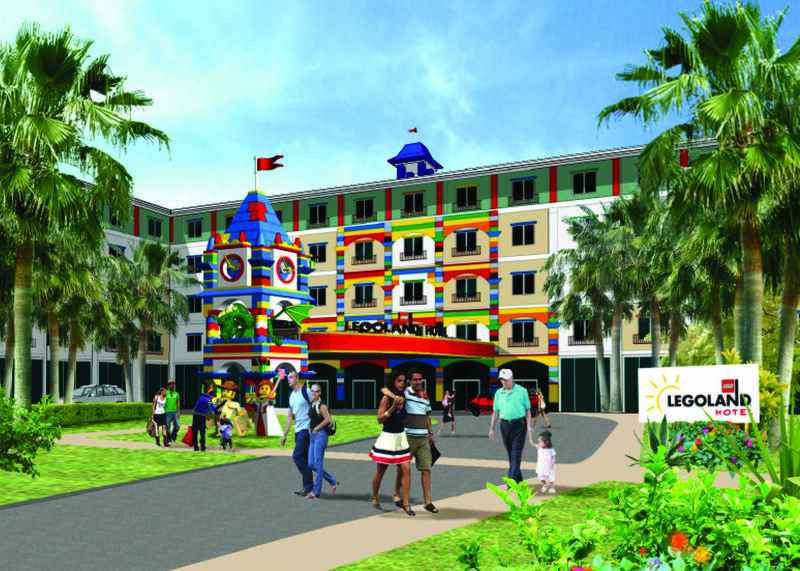 The new Legoland Florida Hotel opens May 15, 2015. Legoland Florida Hotel will have a custom built Master Builders Workshop. 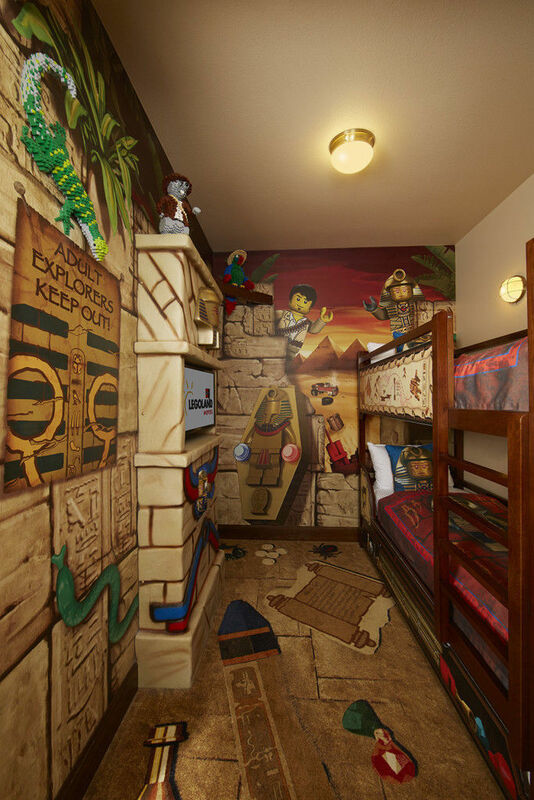 A preview of an Adventure themed room at Legoland Florida Hotel. 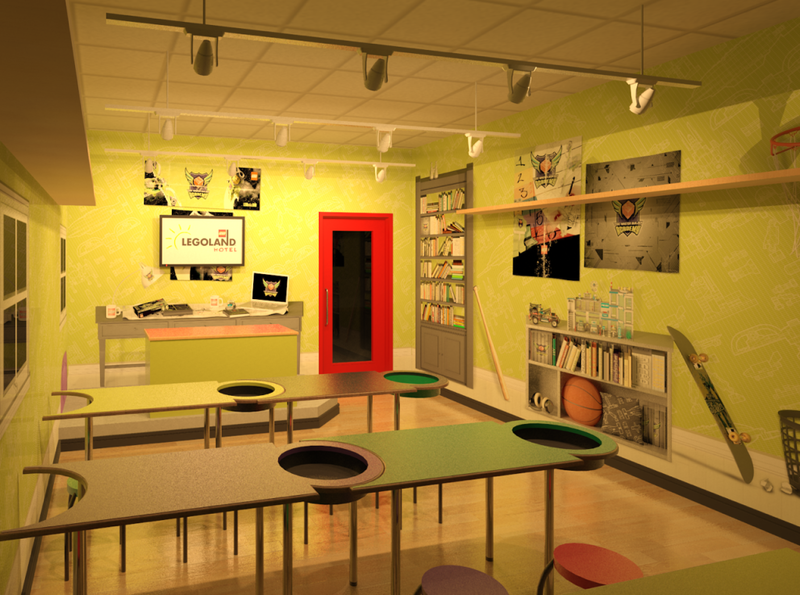 The Legoland Florida will have a themed lobby with Castle play area for little Legolers. At a recent family press event in New York City, the Legoland team from both coasts came together to announce the latest Legoland Hotel, opening May 15, 2015 at the Legoland Florida Resort in Winter Haven. There was a lot of excitement because the company was introducing a fourth style of hotel room at this 152-room resort, to complement the Adventure, Kingdom and Pirate theming at their other hotels. In addition to a hotel, the park will welcome Heartlake City, the newest “land” based on the popular Lego Friends line of toys. We were not familiar with the new Friends line, so we did some homework. The line is clearly designed to appeal to young girls, with new characters Andrea, Mia, Olivia, Stephanie and Emma and an ark full of animals that they can play with. An array of pastel and candy-bright colors dominates the curvaceous building blocks, which feature young women at the beach, in the jungle and at a juice bar. The Heartlake City section of the park promises to have a “Friends to the Rescue” show and a “Mia’s Riding Adventure” horse-themed spinning roller coaster. Clearly, everything is getting awesome for girls – and anyone with what may be perceived as “feminine” interests — at Legoland. According the first reports, the five-story hotel will feature many of the delights of the Legoland California Hotel in Carlsbad, Even better; it’s in a more verdant locale next to the classic Cypress Gardens. Top floor rooms have views over Lake Eloise and the park’s 50 rides, shows and attractions. A large family swimming pool will be located next to the lake. At the entry you’ll see the enormous and friendly Lego dragon made of more than 445,000 Lego bricks, weighing approximately 2,800 pounds. 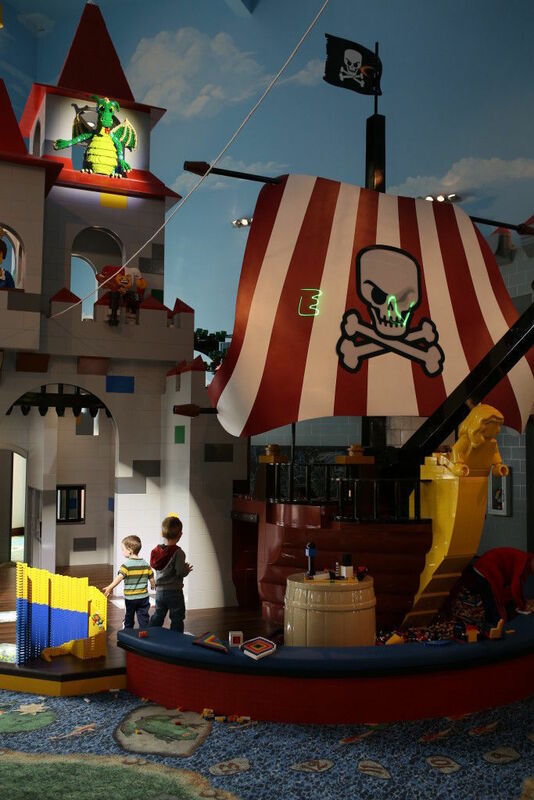 Similar to the California hotel, the lobby’s Castle Play area has a pirate ship complete with a blimp, docked along a moat filled with Legos which surrounds an interactive castle. Kids can pull on a handle as they enter the castle, causing the Lego ogre above them to roar, while parents can look on blissfully from the hotel’s Skyline bar and lounge. There will also be a Lego buffet with a kids’ height table of choices serving a free breakfast to hotel guests. Expect to see more than two million bricks shaped into 2,000 Lego models throughout the hotel. Each room will have a minimum of eight models (Premium Themed rooms have additional Lego models and themed wall paper), and a bucket of Lego bricks for kids to create their own models. All rooms sleeping five have a children’s sleeping area with a bunk bed and trundle bed beneath it (only works for smaller kids), a separate TV, a security peephole at kids’ height, and WiFi. Room service will be available. Check out our video and you can feel the buzz among the littlest members of the press corps. One of our favorite attractions at the Florida park, the Master Model Builder Workshop, is being moved from the park – where it could only be seen on premium tours — to the lobby of the hotel. Daily sessions with builders will be available to guests free of charge. “Legoland Hotel is an extension of the theme park experience and the stars of our park are our Master Model Builders,” said hotel GM Adrian Jones. That move is sure to attract older kids, who were most excited about the behind-the-scenes interaction with Lego pros when it was inside the park. We agree that it should ignite the interest of future Lego builders, just as the hotel will thrill kids. Among other perks, guests at the new hotel will have early access to the theme park, Character Meet & Greets on the premises, and the first Lego Model Shop to be located within a hotel. For a midweek September stay, we found rates starting from $189/night per room. However, due to a seasonal schedule, you can find lows of $117 per night on nights when the theme park is not open. That may be a great deal for your family, as it’s easy to spend a day (Wednesday for example) at the hotel playing indoors and at the pool, then saving the themepark tickets for Thursday, day two of your vacation. Note that a full buffet breakfast for all family members is included in rates. Packages bundling hotel and theme park tickets will include a “2nd Day Park” ticket free. To book a room, visit LEGOLANDHotel.com or call 877/534-6526. Did you know that there are currently five other Legoland theme parks in the world? Legoland California in Carlsbad, Legoland Billund in Denmark, Legoland Deutschland near Günzburg, Germany and Legoland Windsor outside of London are a part of Merlin Entertainments Group. Legoland Malaysia will be the sixth park and the first of its kind in Asia. We can’t wait!